The beaches, carnival, samba, and celebrities on the streets—what does Rio de Janeiro lack? Well, until recently, it lacked hostels, but this has now changed. Here, are the hostels we suggest staying at on your next trip to Rio. Discovery Hostel: Self-described as a boutique hostel; it functions in a mansion that was once the holiday residence of a baroness. Discovery Hostel is located in Glória, just about 2 km away from Santos Dumont Airport. Santa Tere Hostel: Located in the hip neighborhood of Santa Teresa which is famous for samba circles, hipster parties and hosting celebrities like the late Amy Winehouse. It has a modern setting and a beautiful pool. Santa Mix Hostel: Also in Santa Teresa, enjoy a large terrace overlooking the Guanabara bay and enjoy an atmosphere resembles an old and well-kept family home. 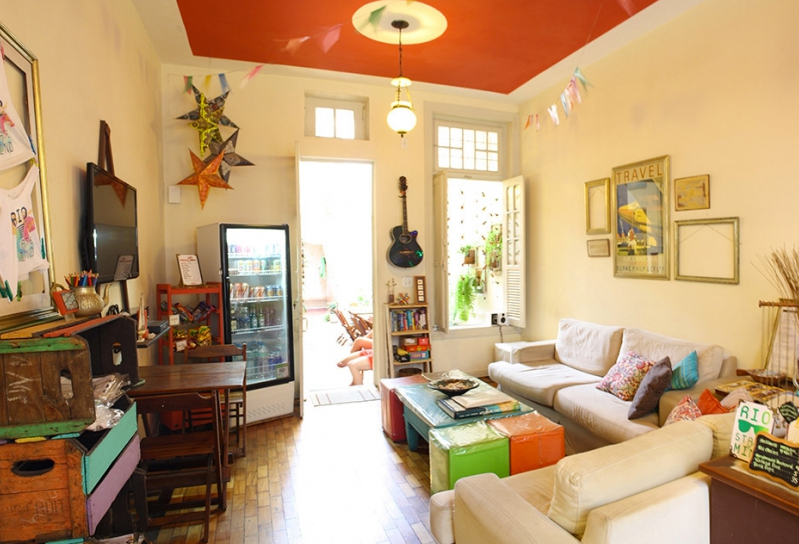 Casa Amarela Hostel: It is located in downtown Rio, in a nice yellow colonial building. It’s easy to find, by metro once you get off at Uruguaiana station. The location is perfect for guests who want to explore the old part of the city by foot. Abraço Carioca Favela Hostel: It has a breathtaking view. This is the main attraction of the hostel located in a shantytown next to Leme beach. Not favela, a community. That’s how the guests say, happy, praising the security of the place. It’s hard to find a room during New Year’s Eve because of the view of the fireworks from Copacabana beach. Gaia Comfort Hostel: Very new and modern interior design, just 100 meters away from the Botafogo metro station and just over 1 km from Botafogo beach. This part of the city is surrounded by some exquisite restaurants (Iraja Gastro, Lasai) and cool bars (Comuna, Meza), but more touristy hotspots like Sugarloaf Mountain and Copacabana are only a 10-minute taxi ride or a few subway stations away. Injoy Hostel: It’s a hostel with a guest house feel. Set in a lovely house at the end of a tree-lined lane, it has modern décor and prime location, next to Botafogo metro station. Injoy is designed to appeal to young, affluent couples and independent 30-something travelers alike. Rio Hostel Ipanema: The best location! It’s 200 meters away from Ipanema beach and 500 meters away from Copacabana Beach. The Pedra da Gávea and the Copacabana Fort, with its famous Confeitaria Colombo, are also within a walking distance. Oh, and there is also a metro station 400 meters away.